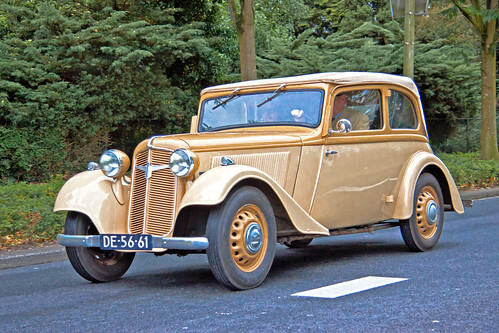 – Adler, the third largest car manufacturer in Germany, behind BMW and Opel, was one of the pioneers of front wheel drive cars, designed by Hans Gustav Röhr. – This Cabriolet has an Ambi-Budd body. – It has a four-speed manual gearbox, a Solex carburettor, a 28 liter fuel tank and front wheel drive. – The chassis with all-steel body has a 104 inch wheelbase, independently suspended wheels, transverse torsion bars at the rear and mechanical drum brakes all round. – The Trumpf Series was also available as 2-door Sedan, as Junior Sport (995cc), as Junior Sport 1100 (1100cc), as 1.7 EV Cabriolet, as 2.0 LITER and as rolling chassis for coachbuilders like Autenrieth, Darmstadt – Germany, Wendler, Reutlingen – Germany , Gläser, Dresden – Germany, Ambi−Budd, Berlin – Germany and Karmann, Osnabrück – Germany.